This page collects information about nutritional facts and other properties of chickpea flour (besan) in summary. The information on this and other food has been gathered from various sources and may not be totally accurate. Among the data shown in this website you can find information about proteins, vitamins and minerals from chickpea flour (besan) and other nutrients like fiber, calories or cholesterol. The proportions of nutrients in chickpea flour (besan) may vary depending on the type and quantity of food, and other factors that might contribute to the modification of its nutrients. Remember that depending on the preparation, chickpea flour (besan) may vary their properties and nutritional characteristics. You can use this information to understand your dietary intake of this food or any other legumes and legume products. This can help you to cook better and healthier recipes including chickpea flour (besan), but remember to consult your doctor or nutritionist before beginning any regimen or make drastic changes in your diet. In your regular grocery store in the group of chickpea flour (besan) you can find chickpea flour (besan) among other available foods. Below you can see information about nutritional facts, properties and benefits of chickpea flour (besan) for your body as well as the amount of each of its major nutrients. This food is abundant in protein. Benefits of eating rich protein foods like chickpea flour (besan) are well known nowdays. 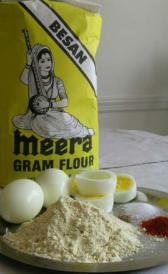 For example, protein in chickpea flour (besan) provides the groundwork for healthy muscles, blood, cartilage and skin. Since chickpea flour (besan) is a food high in carbohidrates we can say thtat this chickpea flour (besan) is a source of immediate energy required by the body to perform numerous mental and physical activities. High fiber foods like chickpea flour (besan) may reduce your risk of cardiovascular disease, diabetes and obesity. Eating high fiber foods like chickpea flour (besan) normalizes bowel movements and helps maintain bowel integrity and health. Because of its fibers, chickpea flour (besan) is useful for controlling blood sugar levels and it lowers blood cholesterol levels. Below is a summary table of key nutrients of chickpea flour (besan) and a list of links to tables showing details of nutritional facts of chickpea flour (besan). They include the main nutrients as well as the proportion of each. The quantity of nutrients shown in the previous table, correspond to 100 grams of this kind of chickpea flour (besan).